play-moneypoker.com - The Rules about Poker You Always Argue About - Revealed! The Rules about Poker You Always Argue About - Revealed! • Whenever you join a game, you need to completely buy-in for it. Full buy-ins for limit poker refers to a minimum of ten times the highest bet for the current game, unless stated otherwise. Full buy-ins at no-limit or pot-limit poker would be forty times the lowest buy-in, unless stated otherwise. • Just one short buy-in should be allowed for every session. • Adding money to stacks is not considered buy-ins and can be done between hands at any quantity. • In games that are player-dealt, packs need to be cut and shuffled before any cards get dealt. The advisable method to keep the game’s integrity would be to have three people join in. The previous dealer collects the discards into a deck before shuffling. 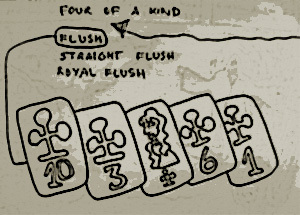 The new dealer’s left player shuffles them and slides them over to the dealer who will cut them through his right player. • The deck needs to be riffled at least four times and the cut has to leave at least four cards in every portion. • The deck’s bottom needs to be protected with the joker cut-card, so no one gets to see the last card. • If there are any shuffling, cutting or dealing complaints, they need to be made before hands are looked at or bets are made. • Within button games, if buttons were previously placed the wrong way, the blinds and buttons will be corrected for the newer hand that will give each player a chance for every round’s position, if possible. • Your personal hand needs to be protected, no matter what. Protect your cards with a chip, your hands, or other objects. If you do not protect your own hand, you cannot redress once it gets fouled or dealers kill them accidentally. • If cards with different colored backs appear during hands, every action will be void and every pot chip will be returned to their respective bettors. If cards with different colored backs are found within the stub, every action will stand. • If two cards that have the same suit and rank are located, every action will be void and every pot chip will be returned to their bettors. • Players who are aware of defective decks have the obligation to tell others about it. If these players try to win pots through aggressive actions, they could lose any rights to refund and their chips will have to remain inside the next pot. • Cards discovered face-up inside the deck will be treated as garbage and replaced by whichever card was underneath it. The same goes for joker cards. • If you play hands without taking a look at every card that you have, it will be your liability if you have a joker or irregular card. • Prior to the first betting round, if dealers deal additional cards, they will be returned as a burned card. • Cards flashed by dealers are treated as exposed cards, although cards flashed by players remain in the game. • Even if you drop your cards during a hand, you need to keep playing with them. • Check-raises are allowed in every game. • Within pot-limit and no-limit games, unlimited raising is permitted. • Within limit poker, for pots that involve at least three players who all still have chips, maximum bets exist and only three raises are permitted. • Wagers need to be a minimum of the previous raise or bet’s size unless somebody goes all-in. • Verbal statements during turns denote your overall action and would be binding. You cannot take that action back. • Tapping the table during turns refers to passes. • Players need to show every card in their hand face-up to collect the pot. • Anybody that sees an incorrect chip amount placed into the pot needs to point this out. • Every losing hand needs to be killed by dealers before pots are awarded. • Showing your cards to one player after a deal gives every player the right to view your cards. • If everybody goes all-in at the final bet, whoever went all-in first has to show his hand first.